The pineapple and maraca are two elements native to the Caribbean culture that Campeche introduces into this painting in the European courtly style as a manifestation of the cultural syncretism that characterizes the colonies of the New Worlds. Both girls are dressed in the Empire style, which not only dominated women’s fashions but was reflected also in the architecture, interior decoration, and furniture of the early nineteenth century in France. This is a style that fits well with the austere spirit of neo-Classicism. According to Rene Taylor, and based on the Languages of Flowers, by Margaret Pickston, the little spray of white and yellow jasmine flowers that the two sisters are holding is a symbol of affability and grace, while the roses may allude to love. NOTE: All the information was provided at the MAPR, and is strictly property of the MAPR. Signed in pencil on lower left, recto. Got $6,000 to $8,000 to spare? Mural by JOHN BALOSSI from 1979 Located Near Expreso Baldorioty For the juegos Pan American Games in San Juan 1979. What happen? It got painted over, erased from our history. Since completing his graduate studies at the School of the Art Institute of Chicago in 2009, Angel Otero has devoted himself to revitalizing painting with a highly concept- and process-driven approach to the well-traveled medium. 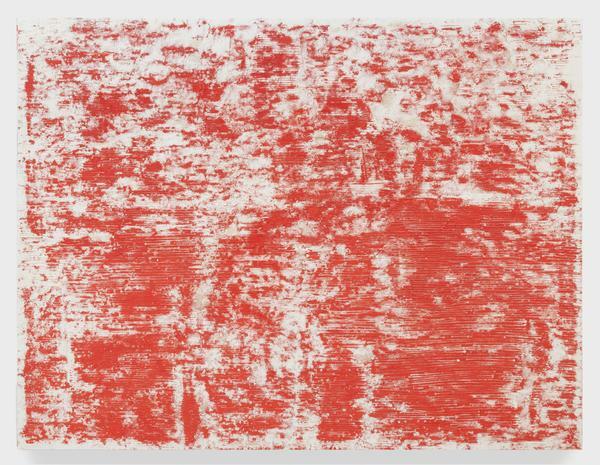 The Puerto Rican-born, Brooklyn-based artist’s recent exhibition at Kavi Gupta offered a tightly focused look at six red-and-white abstractions, the largest of which are 8 by 10 feet. They are all from a 2015 series titled “Lago,” a reference to the red-painted town in Clint Eastwood’s 1973 Western, High Plains Drifter. The compositions are based on family photographs, which Otero manipulates in Photoshop and then enlarges. But as he acknowledged to me in an e-mail, it is virtually impossible to discern anything recognizable in these works. “I guess over time,” he wrote, “I have become shier about the obvious exposition of the content, because it went toward a very nostalgic route, and that was not my intention.” Indeed, without the suggestive name of the series, the individual titles of the paintings and the supporting information provided by the gallery, these works would likely be perceived as pure, allover abstractions. 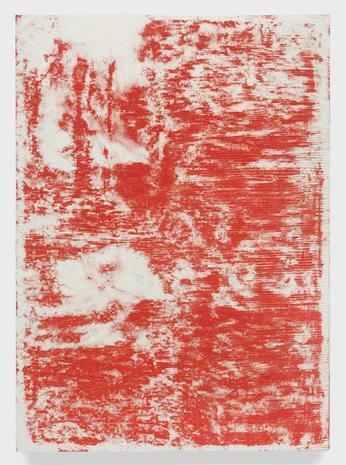 Despite the boldness of the red hue, this series is more subdued than Otero’s earlier highly textured, heavily worked and multicolored pieces, some of which involved applied sheets of rippled dried paint. After digitally converting a source photograph into a series of horizontal lines, the artist projected the image onto a sheet of brown paper the same size as the final canvas. He then traced the projection with silicone, removed the paper from the wall and let the material dry into a flat surface that served as a kind of printing plate. He coated the silicone surface with red cadmium powdered pigment and applied it to a stretched canvas covered with a white acrylic gel medium that acted as an adhesive. Pressing on the back of the silicone sheet, Otero transferred the image to the canvas. The result is a mix between a relief print and a painting, with chance, as in all printmaking, playing an important role in the final image. While the works are dominated by the irregular horizontal lines, there are also red specks and splotches, as well as scattered tan patches—sections of the brown tracing paper inadvertently collaged onto the canvas. These “little accidents,” as Otero calls them, break up the monochrome and add welcome variety to the compositions. As a consequence, the paintings have an appealing sense of imperfection and immediacy. Some, like Tatara, possess a more open feel due to greater exposed areas of the white acrylic gel, while others, like Sober Ghost, are more closed in. However, the variances among these six works are subtle. Otero has been experimenting with silicone transfers since he was a student. But with the “Lago” series, they have grown in size and complexity and gained fresh inspiration, bringing together digital modes of looking with innovative production techniques.